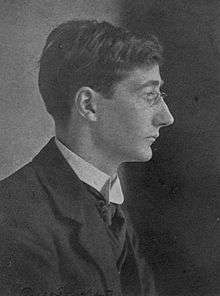 Esmé Stuart Lennox Robinson (4 October 1886 – 15 October 1958) was an Irish dramatist, poet and theatre producer and director who was involved with the Abbey Theatre. As a playwright, Robinson showed himself as a nationalist with plays like Patriots (1912) and Dreamers (1915). On the other hand, he belonged to a part of Irish society which was not seen as fully Irish. This division between the majority native Irish (Roman Catholics) on one side and the Anglo-Irish (Protestants) on the other can be seen in a play such as The Big House (1926), which depicts the burning of a Protestant manor home by the IRA. Robinson's most popular play was The Whiteheaded Boy (1916). Other plays included Crabbed Youth and Age (1924), The Far Off Hills (1928), Drama at Inish (1933), and Church Street (1935). Drama at Inish, which was presented in London and on Broadway as Is Life Worth Living?, was revived as part of the 2011 season at the Shaw Festival (Niagara-on-the-Lake, Ontario, Canada), with Mary Haney as Lizzie Twohig. Robinson's fiction includes Eight Short Stories (1919). In 1931 he published a biography of Bryan Cooper, who had recently died. In 1951, he published Ireland's Abbey Theatre, the first full-length history of the company. He published an edited edition of Lady Gregory's diaries in 1947. In 1958 he co-edited (with Donagh MacDonagh) The Oxford Book of Irish Verse'.. He was also a director and producer, in 1930 he produced a play by Irish playwright Teresa Deevy called The Reapers  and in 1931 he was co-director of A Disciple  along with W. B. Yeats and Walter Starkie. Robinson was married to the daughter of spiritualist Hester Dowden, the daughter of Irish literary scholar Edward Dowden. Awarded annually at the Lennox Robinson Literary Festival, held in Douglas, Cork; first awarded in 2014. ↑ "The Abbey Theatre Archive". abbeytheatre.ie. Retrieved 20 July 2016. ↑ Deevy, Teresa. "The Teresa Deevy Archive (326)". deevy.nuim.ie. Retrieved 21 July 2016. ↑ Deevy, Teresa. "The Teresa Deevy Archive (464)". deevy.nuim.ie. Retrieved 21 July 2016. ↑ "The Lennox Robinson Literary Festival | Douglas, Cork. 27th Feb – 1st Mar 2015". Lennoxrobinson.com. Retrieved 21 July 2016. ↑ "'Sunday Independent' columnist to be honoured with literary award in Cork". Independent.ie. 22 February 2015. Retrieved 21 July 2016. Lennox Robinson profile. Ricorso.net; accessed 21 July 2016.